Instruction manual for early model CB7 4x5 condenser enlargers. 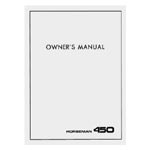 Instruction manual for late model (black finish) CB7 4x5 condenser enlargers. High quality copy of the original instruction manual for the Beseler D.A.T.A. (Data Access Timer Analyzer) Module accessory as supplied for use with the Dichro 45 Color Computer colorhead. Instruction manual for Beseler #8282 (120V) and #8286 (220/240V) Dichro 45 Computerized Color Heads. Instruction manual for Beseler #8278 and #8279 Dichro 45S Color Heads. Instruction manual for the #8145 and #8266 Dichro dg colorheads, as fitted to Beseler 45M series and CB7 enlargers. Instruction manual for for the Beseler #8135 (formerly #P112) Point Light Source Illumination System. 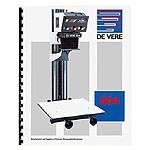 Instruction manual for Beseler #8570 Universal 45 Light Source Systems. High quality reproduction of the original factory instruction manual for Omega D-2 4x5 Enlargers. 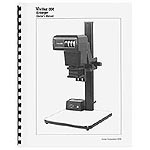 High quality reproduction of the original factory Omega Automega D-3 Enlarger Instruction Manual. High quality reproduction of the original factory Omega Auto-Chromega D-4 Enlarger Instruction Manual. Includes parts list. High quality copy of the later 1976 Omega instruction manual for D2V and Super Chromega D2 Dichroic enlargers.